On our way to and from Leh, we stayed overnight in Delhi. Surprise -- it was hot, which made wanting to leave the air-conditioning of our hotels hard in both cases. But we were glad we did. 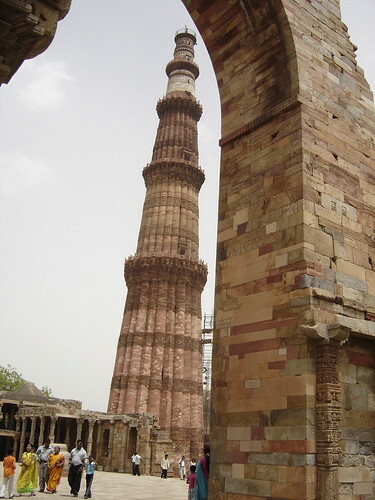 On the second visit, we took the very long rickshaw drive down to the Qutb Minar and the surrounding monuments. It's an amazing structure, 24 or so stories tall, and built in the 1200s. 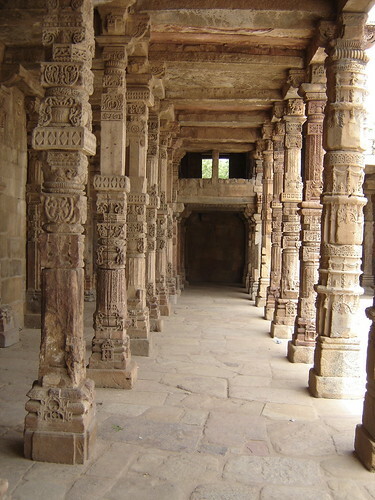 It's surrounded by the outer walls of a mosque whose columns were taken from 27 Hindu and Jain temples and "repurposed." Lots of locals and Indian tourists were there, partly to see it all and partly to have a picnic or take a snooze in some shade inside the large grounds. The place is large and full of interesting stuff, so we decided to get one of the tourist guides who hang out by the ticket windows waiting for lost-looking foreigners. These guides are a mixed bag, but even bad guides can be entertaining. You can be sure that every cornball legend about the monument in question will be trotted out. This guy definitely kept our attention -- he was the Da Vinci Code of tour guides. The Qutb Minar is a big old sundial. 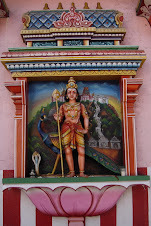 The Hindus needed it for astrological reasons. It looks crooked from one angle because it was used to tell the date of the solstice. What's that, you say? The Muslim rulers built it over many years, as all the signs and guidebooks say? Well, carbon dating shows that the foundations were built in the 4th century. So the base was Hindu. Or something. And "Qutb" is Latin for tower. As Don pointed out later, the word is just about the most Arabic-looking word there is. Latin loves vowels way too much for a word like that. The ruler who got the work started happens to be named Qutb-ud-din Aybak. And you have to admit, the Minar looks pretty minaret-like, right? Coincidence? As you can see, there was a certain pattern in the guide's theories. I wondered if he was just busy making jokes at the stupid Americans' expense, but he seemed caught up in it all. I'd love to go back, get another guide, and see what else I unearth. The truth is out there!